Join the Twin Cities Organized Retail Crime Association (TCORCA) for their second annual TCORCA Conference set to take place on August 16 and 17, 2016. The conference will be held at the Crowne Plaza Minneapolis West, in Plymouth, MN and reigstration is now open. The annual TCORCA conference provides a two-day conference with a variety of topics, keynote speakers, and break-out sessions. Coalition members from across the region and country come together to train and network in the areas of Organized Retail Crime and related subjects. This training will consist of best practices designed to be brought back to the field in order to more effectively and efficiently combat organized crime. 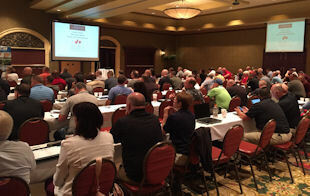 The 2 day 2016 National Cargo Theft Task Force Summit was held June 14-15 at the Shriner's Conference Center in Addison, Illinois, just a few miles south of Chicago. 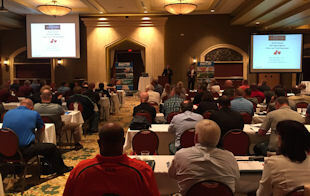 The conference was hosted by title sponsor NICB (National Insurance Crime Bureau) and Travelers Insurance. The 300+ attendees was composed of 80% law enforcement and 20% from logistics, security, pharmacy manufacturers and insurance companies. Attendees heard presentation from numerous experts from various Cargo Theft Task Forces from around the country; US Attorneys and District Attorneys prosecuting cargo theft cases; and supply chain/security experts. Traveler's Insurance provided data showing the top cargo theft states to be, again, California, Florida and Texas. The data detailed thefts of cargo from manufacturers and retailers has shifted from electronics in 2007 to groceries, soft drinks and apparel in 2015. The Mid-West Cargo Theft Unit's Memphis Cargo Task Force, led by the FBI and comprised of FBI, US Marshals and local law enforcement, presented their interstate cargo theft investigation which began in Memphis, TN and extended to Nashville and ultimately to the fence located Detroit, Michigan. According to US Marshal Service's Oscar Blythe, "the Kroger ORC teams played an active and vital role in this investigation. Kroger ORC teams partnered with the task force for this operation to provide product for the bait load, surveillance, assisted with identifying stolen products and providing logistics for the $1M+ seizure at the fence's warehouse in Detroit". ORC Investigators Donny Blackwell and Glenn Alred were presented with Outstanding Merit Unit Citation Awards from the FBI and the task force. Interesting, but not surprising, was the link between cargo thefts and ORC. Cook County State Attorney Dave Williams and Chicago Police Detective Oscar Valenzuela discussed the investigation and prosecution of cargo theft organizations. A very well-rounded and very good conference with input from law enforcement, prosecutors, pharmacy manufacturers, insurance companies and anyone who is involved in the investigation of cargo thefts. Thank you Denny Dansak, Sr. Corporate Manager ORC, Kroger, for this submission!